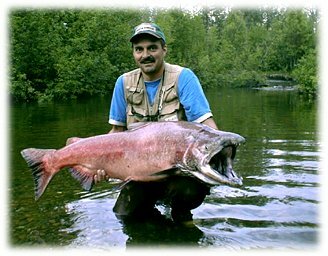 Alaska king salmon fishing in the Matsu Valley can provide hogs like this 50 plus pounder on a fly rod. Purple Death was the pattern to entice this fish. Not All Hogs Are Made Of Pork! Rick Patterson of Mountain Green, Utah is the angler responsible for giving Purple Death its name. A few years back, Rick and a friend flew up to stay at the house and fish kings in the Valley before heading to the KP for reds. I was scheduled to work the first day they would fish, so I gave them directions to a local hot-spot and a handful of nameless fuchsia bunny leaches. I'd been using this pattern for a few weeks prior with great results and was confident they'd at least hook a few fish. When I returned from work and inquired about their day their simultaneous expressions spoke volumes as they began to relay their stories. They found fish right away, just where they should be, but the big fish were effectively ignoring everything they drifted past. Then they remembered the "purple" flies. I want to say Rick hooked a king on the first cast, but it might have been the second or third, and the action to follow was legendary with huge fish repeatedly smashing the flies as they slowly drifted through the deep holding water. I was informed the fly was called "Purple Death" and with a shrug and chuckle the name stuck.